Some great entries guys! Thanks for entering! Me and Hayden will soon decide the winner. I'm sorry, I didn't got my entry in time, so it's just a free build. Of course, Critism is very apperciated, since this is my first ship. Great job on your first ship Buurli! Sorry you missed the deadline. I am pleased to announce the winner of the LC6. Any chance of participation points Mark/Hayden? ^ Thanks guys. That was good fun and I'm stoked to win against such strong opposition. As one Outlaw has commented - "I'll give it to Loreos, they are the Kings of ship manufacturing." Loreos. The land of the sun. Stretching for countless miles, the Great Loreesi deserts are an intimidating an obstacle as the highest of the Garheim peaks, the densest of the Lenfald forests, or the most stinky of the outlaw swamps. Many an outlaw has melted and Garheimian boiled in their boots trying to cross their vast shimmering expanses. Lenfels survive through the hospitality of their Loreesi friends, which is matched only in warmth by the sun. But how do the Loreesi survive? To your character, the desert is like a second mother and survival is second nature. For this challenge, create a build showing your character quenching their thirst. It could be in a rowdy tavern, or an elegant coffee house, or beside a deep cool well, or in an Eden-like oasis. Alternative Scenario for those all at sea - Water, water everywhere and not a drop to drink. In the last challenge we saw our heroes set sail. I'd hate to get in the way of a good adventure, so if your story is now taking place on the high seas, then you are still in need of something to drink. Show your character obtaining their daily moisture at sea. Be it from well prepared rations, or an ingenious method of extracting it from the seascape around them. 2. Your build must be built of Lego. Custom string, cloth, stickers and a smattering of custom arms and armour are allowed. 3. 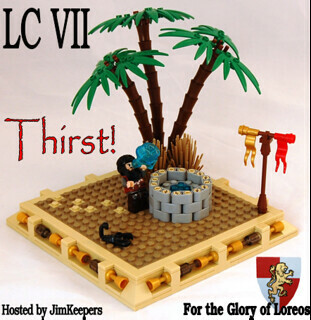 Your build must show your LCC character and the Loreesi colours must be proudly flown - feel free to come up with an ingenious way of doing this. 4. Everyone loves a good accompanying story. 5. There is no size requirement or restriction. But bear in mind quality beats quantity and a minfig holding a cup (with nothing else) is not going to be seen as sufficient effort. 6. Your build must be posted in this thread by 31st October 2012, High Noon London time (that will be 11pm Sydney, 4pm Moscow, 1pm Paris, 8am New York and 5am LA)*. 7. The winner will be decided by public vote. In the event of an inconclusive vote I shall decide the winner (I'm not entering). 8. All participants making a suitable effort will receive 2 points and become eligible for their very own piece of Loreos. 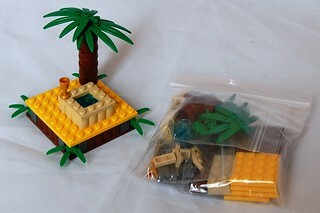 Just for joining in, I will send you a free parts pack from which you can build this mini oasis. To get the prize you will need to send me a private message (pm) with an address. If you are a minor, please ask your parents if it's ok to give out an address. We don't want anyone getting in trouble, especially me! - Your address will only be used for sending this out and no record will be kept of it. Packs will be sent out after the competition finishes and the pm's then deleted. Royal Mail worldwide delivery is included in the prize. If you don't pm me an address, I'll assume you don't want any freebies and are only here for the glory - (my wallet salutes you). 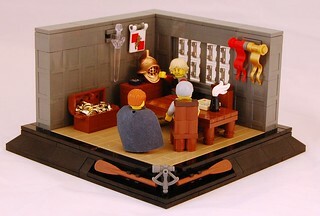 There is a limited number of mini sets available, but this exceeds the number of current Loreesi members. To ensure time for a high standard of building, existing members will be guaranteed a set. And all remaining sets will be allocated on a merit basis. 9. The winner will receive a whopping 6 points and the mini oasis if you wish. In addition you will receive the adulation and envy of all others, at least until the next LC. Good luck and remember, you are building for the Glory of Loreos. *I've just realised that I didn't check the closing date with Mark, so he may wish to amend this. I will make clear if he does! EDIT - Mark has agreed the end date - good I didn't want to work out all those times again - with daylight savings it was hard! Just to clarify, everyone who enters get a miniset? Yes. If your entry meets the rules you get a miniset. I am happy for a fair number of new commers to take part as well (based on the normal rate of new applicants). But if lots suddenly start signing up for Loreos just to get at the Lego, then I will have to restrict the remaining sets to members who were in place at the begining of the competition. I have a set for every existing Loreos member, plus a few, bagged up and ready to go. Edit - Just to be absolutely clear from the start and because I'd like people to take the time to do a decent build and not all be rushing to get an entry in. I have modified rule 8. Hopefully that makes it clear. - Existing members take your time and get a good entry in. New commers are welcome and you will get a set if there is one available, but obviously my wallet is limited, so if we do get tons of people signing up then they will go on a merit basis to the new commers i.e. it then goes on the best builds. How many sets are available for the newcommers depends on how many exsiting members enter and I may put together some additional sets if the standard is good. 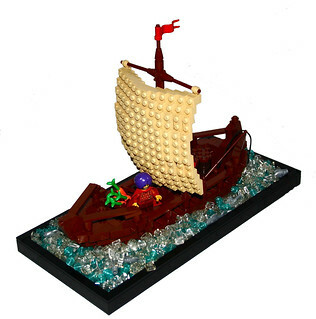 Congrats to Jim at winning the Boat LC and whoa what a great hosting of the next one, looks like a very intresting one. Thanks a ton for doing this Thomas! I'm so going to enter. The end date is perfect! I will see if I can find the time to do an entry this time. That's incredible, Thomas! I'm definitely going to enter! It's great to hear such enthusiasm. and I'm so looking forward to what you're all going to come up with. Mark has just approved another little surprise for participants. So as well as following the normal forum guidelines on posting your entry, if you could include a link to a relevant flickr page, you may discover a little something appearing. I'm afraid (to my shame ) I don't know much about MOC pages or other image hosting sites, so I'm not sure if it's going to be possible there. But I'm sure if it is, someone wiser in these things will point me in the right direction once all is revealed. Ohh the tension grows! I'm going to start on my entry now! BTW I'll have the new group points up soonish. Plus with this wonderful incentive, I hope everyone will try to enter, we need some more activity!